- Du PONT, PIERRE S.
Home » Du PONT, PIERRE S.
In 1902 Pierre S., along with his cousins Alfred and Thomas Coleman, purchased E. I. duPont De Nemours from their elder relatives. Several years later, Thomas Coleman, desiring to liquidate his holding of the family company stock offered it to the company for outright purchase. Alfred, believing the asking price too high was infuriated upon discovering that Pierre S. had disregarded his opinion and with the aid of trusted family members and friends purchased Thomas Coleman's stock. This set off a vicious court battle between two family factions eventually ending in victory for Pierre S. and those members of the family involved in his syndication. Later, Pierre S. served as Chairman of the Board of General Motors. 1931, Maryland. 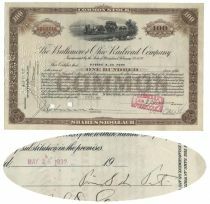 Stock certificate for 100 shares of the Baltimore and Ohio Railroad Company. Brown/Black. Vignette of early train at center. Issued to and signed on verso by PIERRE S. duPONT (1870-1954); President of duPont from 1915-1919. In 1902 Pierre S., along with his brothers Alfred and Thomas Coleman, purchased E. I. duPont De Nemours from their elder relatives. Several years later, Thomas Coleman, desiring to liquidate his holding of the family company stock offered it to the company for outright purchase. Alfred, believing the asking price too high was infuriated upon discovering that Pierre S. had disregarded his opinion and with the aid of trusted family members and friends purchased Thomas Coleman's stock. This set off a vicious court battle between two family factions eventually ending in victory for Pierre S. and those members of the family involved in his syndication. Later, Pierre S. served as Chairman of the Board of General Motors. Stamp and punch cancellations do not affect duPont's signature. Choice condition. PIERRE S. DUPONT. 1920, New York. 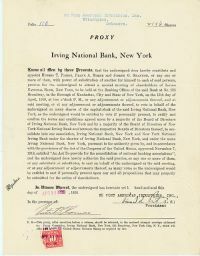 An "Irving National Bank" proxy document signed by "Pierre S Du Pont" as president of "Du Pont American Industries, Inc." He appointed three men to vote for him at the shareholders meeting. The document is in choice condition overall.